About a year after my family and I moved to the development town of Migdal HaEmek, I ran for head of the local council as part of the center-left Mapai party. I was only twenty-five years old at the time, but I won the election, serving as the head of the council for the next eighteen years – from 1959 until 1977. During that time, the situation in the town was very difficult. Migdal HaEmek had been founded in 1953 as part of an initiative to build development towns in Israel for the purpose of settling immigrants flocking to the new state. As such, Migdal HaEmek absorbed immigrants from thirty-two different countries, but there wasn’t enough employment for all the people that came. Therefore, my efforts were directed toward developing employment opportunities as well as education venues. My efforts in education were greatly aided by Rabbi Yitzchak Grossman who came to Migdal HaEmek in 1964 and with whom I forged a strong bond. 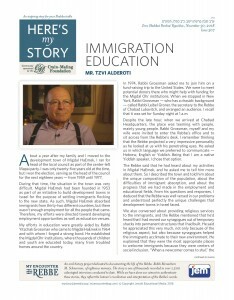 He established the Migdal Ohr institutions, where thousands of children and youth are educated today, many from troubled homes around the country. In 1974, Rabbi Grossman asked me to join him on a fund-raising trip to the United States. We were to meet potential donors there who might help with funding for the Migdal Ohr institutions. When we stopped in New York, Rabbi Grossman – who has a chasidic background – called Rabbi Leibel Groner, the secretary to the Rebbe of Chabad Lubavitch, and arranged an audience. I recall that it was set for Sunday night, at 1 a.m. Despite the late hour, when we arrived at Chabad Headquarters, the place was teeming with people, mainly young people. Rabbi Grossman, myself and my wife were invited to enter the Rebbe’s office and to sit across from the Rebbe’s desk. I remember thinking that the Rebbe projected a very impressive personality as he looked at us with his penetrating eyes. He asked us in which language we preferred to communicate – Hebrew, English or Yiddish. Being that I am a native Yiddish speaker, I chose that option. The Rebbe said that he had heard about my activities in Migdal HaEmek, and he asked me to tell him more about them. So I described the town and told him about the unique composition of the population, about the difficulties of immigrant absorption, and about the progress that we had made in the employment and educational fields. From his questions and responses, I deduced that the Rebbe was well versed in our problems and understood perfectly the unique challenges that development towns in Israel faced. We also conversed about providing religious services to the immigrants, and the Rebbe mentioned that he’d heard that I had moved our synagogues out of temporary shacks into permanent structures that I had built. He said he appreciated this very much, not only because of the religious aspect, but also because synagogues helped the immigrants acclimate to their new environment. He explained that they were the most appropriate places to welcome immigrants because they were centers of social inclusion. “When a newcomer comes to shul,” the Rebbe said, “he already feels at home as a Jew. There he makes new friends and, as relationships develop, he gets invited to the homes of neighbors for tea, and this is how connections between people begin to form.” The Rebbe said he knew that the Migdal HaEmek synagogues were very helpful in integrating new immigrants, and that other places in Israel should learn from us. Later in the conversation, the Rebbe turned to my wife and said to her, “I know that you are a principal of a school, and I’ve heard about your activities and the awards you received.” He added that he appreciated all the education work she did in Migdal HaEmek, and he emphasized that education is the foundation of Judaism, so it must be organized and thorough, which requires a great investment of energy. The Rebbe also suggested to my wife that Israeli schools should try to separate boys and girls. As an example of a precedent, he mentioned the education system in England where separation between genders in school has been accepted for many years; it has been very successful there as evidenced by higher grades earned by the students. My wife answered that in her opinion it would be impossible to separate genders in Israeli schools because such a basic reform would require the approval of the Ministry of Education. She doubted that the secular sector would agree to this, nor would the national religious sector. In response the Rebbe said that the first attempt should be made in the secular schools. “You will not be able to convince the national religious people because, for them, this would represent political interference,” the Rebbe said with a smile. He then suggested that a pilot program, including a control group, be organized in a professional way, in order to track the students’ achievements over the course of several years, with the goal of showing that gender separation improves student achievement. Toward the end of the meeting, the Rebbe asked my wife how many children we had, and she responded that we had four children – three boys and a girl. She had with her a picture of our daughter, who was a baby at the time; in the photo, lit Shabbat candles could be seen in the background. My wife took out the picture and showed it to the Rebbe, who noted the candles, and that the picture was taken after Shabbat had begun. He took out a quarter and gave it to my wife for the baby, and told her that when our daughter grows up a bit, she should teach her to light Shabbat candles every Friday. The whole meeting lasted about forty minutes, and although a buzzer rang several times throughout it, signaling that we should conclude because there were other people waiting to come in, the Rebbe didn’t cut the meeting short. When we left, a big group of yeshivah students holding recorders surrounded us and requested to hear exactly what the Rebbe told us. Also, throughout our journey across the United States, whenever we came to Jewish areas, Chabad representatives waited for us, eager to hear what the Rebbe had said. The meeting with the Rebbe was a very special experience for us. It’s been a milestone in our lives, and the memory of it has accompanied us throughout all the years which have since passed.